Check our website often for new job postings, upcoming recruitment and educational events, and for Duke Nursing news updates. We also encourage you to learn more about life as a Duke nurse through our social media channels by connecting with us on Facebook and Twitter. Duke University Health System (DUHS) achieved Magnet Recognition again on November 14, 2018, a testament to its continued dedication to high-quality nursing practice. 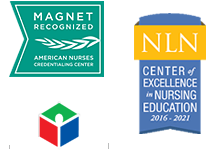 The American Nurses Credentialing Center’s Magnet Recognition Program ® distinguishes health care organizations that meet rigorous standards for nursing excellence. This credential is the highest national honor for professional nursing practice. The Magnet Recognition Program ® designation indicates achievement of high standards of quality care delivery for patients and their loved ones and a positive professional practice environment for staff. It also represents a focus on care delivered by nurses who are institutionally supported and empowered to achieve excellence. "This honor is the culmination of continuous effort by DUHS nurses to ensure the best possible care for our patients and their loved ones wherever they receive care in our health system," said Mary Ann Fuchs, DNP, RN, NEA-BC, FAAN, vice president of patient care and system chief nurse executive for DUHS.